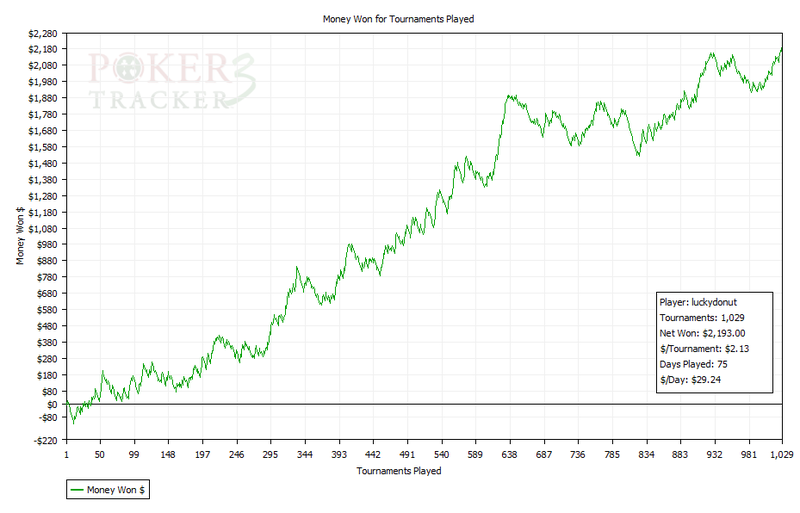 Since Poker Tracker 3 was finally released a couple of weeks ago I’ve been dying to try out it’s graphing features, hoping that it would mean I’d be able to stop using my clunky Excel spreadsheet to keep track of tournament results and let it do all the hard work for me instead. However, getting to this stage wasn’t particularly easy. The database conversion tool would not run (reporting a lost database connection after about ten minutes every time I tried) and even though I’d tried to keep all my hand histories and tournament summaries in anticipation of PT3, it turns out I didn’t have a complete set. I had still been loading my results into PT2 as well as keeping them in the spreadsheet. It’s not that I don’t trust the older Poker Tracker, it’s just that it could only tell me how great I’ve been playing with numbers. For as much as I love the raw stats, if you can’t show it on a graph, it didn’t happen. The data had tallied exactly for months, so nothing less than a perfect database migration would be good enough. To get there I ended up exporting my hand histories from PT2 into text files and loading them into a fresh database on PT3. This actually isn’t such a bad way to do it if you want some control over the data you bring into the new version. You can put a filter on the hands that are exported, so for now I selected only Poker Stars and only the turbo SNGs I cared about. I left out the couple of hundred EPT Steps that I’d played earlier in the year that had been stinking up my results as well as about 200,000 datamined hand histories on iPoker that I didn’t need any more. About 20 minutes later, it had almost worked. 1,029 tournaments is the magic number, and this added up, but why on earth did it think 11 of them were different? They should all be no limit! After that, all was right in the world. So, what better time than now for a bit of results-oriented analysis. A thousand hands is getting into the realms of a significant sample size and the signs are still fairly good. A 13.3% ROI from turbo SNGs is fairly satisfying as far as I’m concerned. 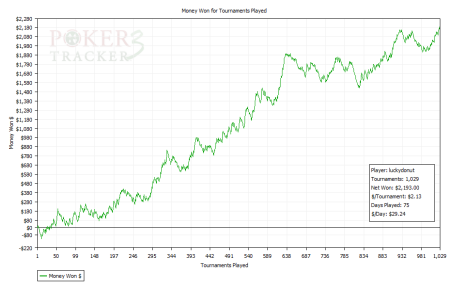 $2193 profit is also something I can take to the bank, even if it is a bit depressing when the graph reminds me that I’ve been going mad at these sit-and-gos for what equates to an actual a win rate of about $2 per tournament. I play four at a time and each set usually takes about 45 minutes to complete. I could try playing more, but I already struggle a bit the times that I get short handed on all four tables, so giving myself more things to think about at a critical time is probably a bad idea. There’s a little extra value to be gained from player points, deposit bonuses and buying tournament dollars but even so (assuming this is sustainable) I won’t be giving up the day job for what would be – at best - about $12 per hour. This is going to be a disruptive month with my trip to Las Vegas and Laughlin around the corner, but if I get chance for a few serious sessions I think it’s about time I took a shot at the next level up ($25+$2) and see how I get on. Good luck to me.